Can the use of digital manufacturing in engineering education increase student engagement? Can the use of self-guided learning via digital manufacturing increase insights and understanding of the design and manufacturing process? Can the use of self-guided learning increase the enjoyment and desire to learn? The study involved a class of 90 undergraduate engineering students. Introductory lectures were given on topics such as digital manufacturing, additive and subtractive manufacturing, and 3D design and printing processes. 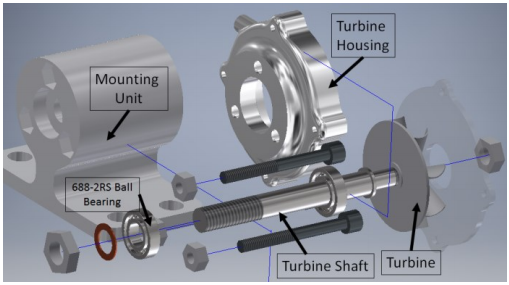 The students were given background information along with examples of publications on turbine design, then were divided into groups of three and given periods between four and seven weeks to design and test turbocharger blades. The students were given a lot of freedom, as no prescribed methodologies or solutions on turbine design were provided. The project was designed to be carried out for low cost; two 3D printers were used, one of them a Zmorph. The material used was PLA. Cura slicing software was used, along with Autodesk Inventor Professional for design. Four major components were included in the turbine design: the turbine itself, the housing, the turbine shaft and the mounting unit. The students had to consider the following parameters: blade radius, blade angle, blade thickness, and number of blades. The 3D printing itself had to be completed within a 40 minute period, and the turbine performance and characterization had to be completed within an hour and a half prototyping lab. Each student group had to determine what printing settings to use. Once the part was completed, the turbine speed, dimensions, and layer morphology were evaluated, followed by a feedback session. A student survey was carried out to evaluate the students’ prior knowledge in 3D printing as well as the level of interest and value in the course. All of the students had some prior knowledge of 3D design, but limited experience in 3D printing. The researchers conclude that in the future, it may be useful to offer different levels of challenge to the students based on their prior experience. Overall, the course was highly successful, with the students reporting largely positive and enthusiastic feedback. The researchers state that the course could have benefited from more than one prototyping session, which may be included in a future course. The benefits of digital manufacturing and 3D printing were clearly shown, however. “The course has great potential as a platform learning experience to educate engineers in a number of critical areas of digital manufacturing, covering innovation, engineering design, manufacturing, simulation, and prototyping whilst being low cost and easily replicated,” the researchers conclude. Authors of the paper include Dr. Shane G. Keaveney and Professor Denis P. Dowling.